Mie Gisèle Roc sits by the tent that became her home after the earthquake. On the afternoon of January 12, 52-year-old Haitian Mie Gisèle Roc was watching television at a friend's house. Suddenly, at 4:53 local time, the ground beneath the house pitched and heaved. Mie clung to the bedpost beside her as the ceiling and walls collapsed. but stripped of family, friends and the basic necessities of life. Within hours after the earthquake, American Bible Society pledged its support to the Haitian Bible Society and started the Bible distribution effort that depleted its entire stock. A few weeks later, American Bible Society responded to another urgent request for Bibles from the Haitian Bible Society to continue distribution. a million Haitians with access to clean water. Now, more than six months after the earthquake, Haiti is at a crossroads. Many Haitians like Mie still live in makeshift huts with blue tarp roofs and mud floors. Some people, desperate to support their families, spend each day sifting through the rubble for items to sell on the streets. The government, which lost workers, buildings and resources in the earthquake, is struggling to rebuild the country's infrastructure. 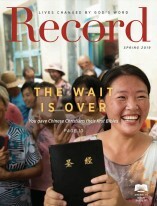 A recent ministry assessment trip vconducted by Shamalia Snipe, a senior research analyst for Global Scripture Impact (GSI), the research arm of American Bible Society, found a staggering need for Scripture in the aftermath of the earthquake. As she visited Haitian churches and met with children, many people approached Snipe to ask for Bibles. In the coming months, ABS will provide 25,000 Scriptures —10,000 in Creole and 15,000 in French — to Haiti. In the midst of the mud, debris and endless tarp shacks, God's Word will provide Haitians with a ray of hope. After the earthquake, American Bible Society raised more than $680,000 in disaster relief for Haiti, the largest crisis response campaign in ABS history, thanks to our donors. Young people around the world discover Scripture.